Basophils are a kind of white blood cell. Along with several others types, they play a role in your immune response when you are fighting an infection (most commonly, one caused by a parasite). Basophils are also involved in producing some of the symptoms caused by allergic reactions, such as watery eyes, sneezing, and runny nose. Basophils, like all blood cells, arise from stem cells in the bone marrow. They develop and differentiate through a process called hematopoiesis, during which blood cells specialize in their structure and function. They are released from the bone marrow into the circulating blood as mature cells. Basophils circulate in the blood and normally live for a few days before they degenerate and are replaced by new basophils. The blood cells produced in the bone marrow fall into the categories of red blood cells, platelets, and white blood cells. There is about one white blood cell (leukocytes) per 700 red blood cells (erythrocytes). Basophils make up about 0.5 percent of the total number of white blood cells. White blood cells are most important in immune function and inflammation, red blood cells carry oxygen on their hemoglobin component and oxygenate our bodies, and platelets help form blood clots to prevent blood loss. Basophils are granulocytes, which means that they contain small granules inside them. The granules store and release enzymes and chemicals, specifically histamine, that promote the widespread inflammatory reaction characteristic of basophils. On a typical blood stain (a lab technique used to evaluate cells), basophils appear bluish or purplish in color, and many granules can usually be seen easily. Basophils are about 14-16 µm in diameter. To give a sense of how their size compares to other cells, red blood cells are about 6.2–8.2 µm in diameter. Basophils are part of the innate immune system, which means that they are activated when infectious organisms enter the body. They work together with other white blood cell types, each of which has its own enzymes and chemicals, to defend against invading microorganisms. As part of the innate immune system, basophils do not make you immune to an infection that you have had in the past. They non-specifically attack infectious organisms, even if you have never encountered that infectious organism before. This means that basophils do not remember the infectious organism, but instead simply recognize the invader as something that does not belong in your body and that should be destroyed. The action of basophils is most effective in protecting against bacteria and parasites, including external parasites such as ticks. The granules inside the basophils contain histamine and heparin. Histamine is a vasodilator, causing the blood vessels nearby the infection to widen, allowing more immune modulators to have access to the infectious organism. Heparin is a blood thinning substance produced by the body that prevents blood clots at the site of the infection. Basophils bind to and may trigger the production of immunoglobulin E (IgE), an antibody that helps protect against parasites. 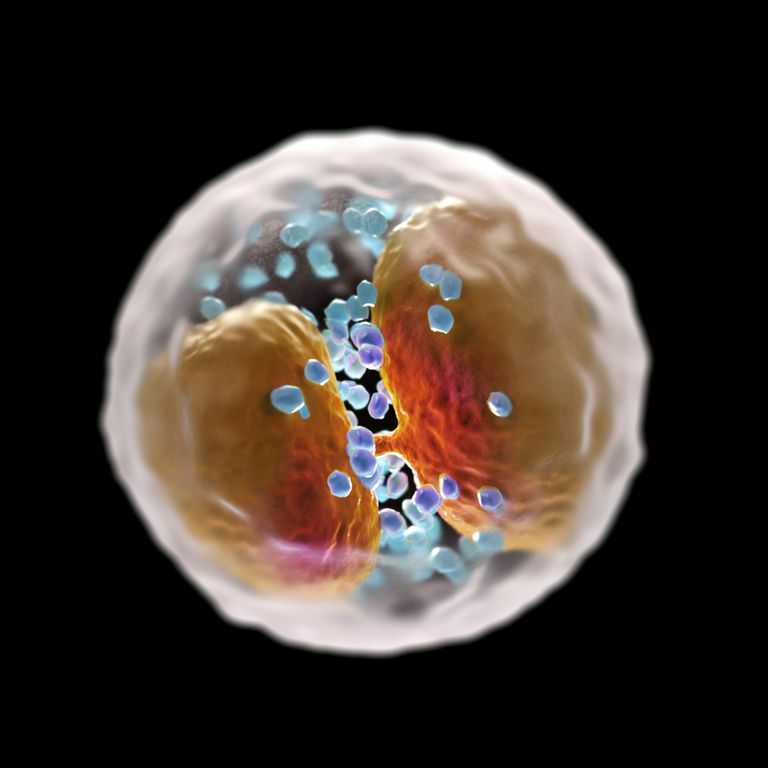 Basophils also participate in phagocytosis, which is the process of destroying an invading organism by taking it apart so that it cannot harm your body. Basophils have a diagnostic value in that high or low basophil counts can suggest what type of condition is at play. The value can be expressed either by a percentage or by an actual count of cells in a microliter (mL) of blood. A complete blood count (CBC) is used to evaluate the blood composition. A normal basophil percentage is between 1 percent and 2 percent of the total white blood cell count (WBC). By contrast, a normal absolute basophil count can fall between 0 to 0.3 cubic millimeters (k/ul). The absolute basophil count is calculated by multiplying the percentage of basophils by the total number of white blood cells. The blood test results can confirm when your basophils are abnormally high (basophilia) or abnormally low (basopenia). Basophilia may be a sign of chronic inflammation in which excessive white blood cells are produced. Alternately, it may be related to an underactive thyroid gland (hypothyroidism) or a condition that causes the overproduction of white blood cells in the bone marrow. Basopenia typically occurs with acute inflammation or infection, a severe allergy, or an overactive thyroid gland (hyperthyroidism). In general, the number of white blood cell types, rather than just one type, will be considered when evaluating an illness. On their own, basophilia or basophilia offer little more than a suggestion of where a diagnostic investigation should begin. Basophils, along with IgE antibodies, can mediate response to allergens. The histamine that is released by basophils is one of the causes of the symptoms of common seasonal allergies. Histamine can trigger watery eyes, itchy skin, and a runny nose. This is why antihistamines, which block the actions of histamine, are effective for reducing symptoms of allergies. It is not completely clear why these allergic reactions occur. In fact, an experimental study using basophils from people with allergies found that the basophils themselves were neither hyperreactive nor hyporeactive when removed from the body, suggesting that there is a more complex, yet not well understood allergic mechanism at play. The types of diseases associated with abnormal basophil values are far-ranging and differentiated by whether values are high or low. In addition to hypothyroidism, basophilia is associated with a wide range of infections and inflammatory autoimmune disorders, including chickenpox, smallpox, influenza, tuberculosis, ulcerative colitis, and rheumatoid arthritis. In addition to hyperthyroidism, basopenia is more commonly seen with severe allergic episodes, such as drug-induced hypersensitivity reaction and anaphylaxis (a potentially life-threatening, all-body allergy). Basopenia is most commonly noted when there is urticaria (hives) or angioedema (a severe, generalized swelling of the skin). Basopenia can also develop during the early (acute) stages of infection. While basophilia is more common with blood cancer, basopenia may result from the radiation or chemotherapy used to treat cancer.